Croats have a few really nice beers available to them in their marketplace. 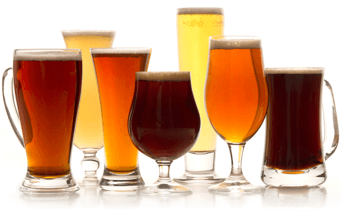 However, since they are wedged between Italy and southeastern European nations that have traditionally gravitated toward wine consumption, the variety of available beer styles leaves a bit to be desired. Thus, like most other nations, their most popular beer style is the style that is most popular the world over: pilsner. Thankfully, they prefer the flavorful Czech variety, and the folks at Karlovacko Pivovara have grown quite adept at producing this beer over the last 150 years. Founded just 12 years after the style was created in Plzen, Bohemia, the brewery has been making this style of brew for just about as long as the style has existed. Pour this beer into a flute glass for the most impressive visual appeal. Have a quick sniff and notice how the nose presents sweetly grainy malt notes backed by mild floral and spicy hops. Look also for that distinctly clean, crisp aroma that helps define this style. Ok, once you’ve admired the appearance and aroma, take a sip. Expect a biscuit-like malty start that quickly turns sweet and then slides toward hoppy and spicy. The finish is quite bitter but does not linger too long as it mingles with floral hoppy elements. Overall, we found this beer to be soft, fragrant and complex with a delightfully dry finish. Great with a host of Asian-themed cuisines—from spicy curried Thai to freshly rolled sushi. Guided by the principles and tradition of quality, Karlovacka Pivovara (pivovara means brewery in a number of Slavic languages) has been delivering liquid pleasure to numerous beer lovers for over 150 years. The brewery, located in Karlovac, Croatia, is not only the oldest brewery in the state, it’s also a beloved symbol of the town and is one of the most significant companies in the entire Karlovac county. The city of Karlovac is located on what is essentially a landlocked peninsula, flanked on three sides by four rivers which supply rich springs of pure water used in local beer production. The Karlovacka Pivovara is frequently referred to as the city’s 5th river by local residents on account of the volume of beery goodness that continues to flow from its brewhouse. That beer has been drunk in Karlovac for centuries is a regionally well-known fact, but the reality is that beer was produced here long before Karlovacka Pivovara was founded in 1854. According to recent research, the oldest documented proof of beer making puts brewing in Karlovac at 1779. A record in a tax register from that year reveals that a citizen named Georg Pürstl paid taxes as “braxtor seu questor” (beer maker and shop keeper). That means that he was producing beer over 225 years ago in Dubovac (the same part of the town where the brewery is today). Other documents indicate that a number of breweries were in operation around this same time. As is often the case, many years transpire between the inception of town brewing and the collection of taxes. It’s not unreasonable to expect that more thorough research of the historic documents could move the origins of brewing in Karlovac to an earlier century, or the establishment of the Karlovacka Pivovara 75 years earlier—to 1779 instead of 1854. For now, the official beginnings of Karlovacka Pivovara are traced back to 1854 when, according to Rudolf Strohal, a well known historian from Karlovac, “Baron Nikola Vranyczany built a special building for a new brewery, so called ‘Perhovo’ in Dubovac.” Over the next 50 years the brewery changed hands and functions a few times (for a brief period it was converted to a pottery), until the early 1900s when it saw one of its most expansive periods of growth during Vilim Wambrechtshamer’s reign as technical director. Ultimately becoming part owner of the brewery, in 1929 Wambrechtshamer sold his shares to Zagrebacka pivovara for 3.5 million dinars, a huge amount of money at the time. Fast forward to 1992 when, after the independent state of Croatia was established, Karlovacka Pivovara, became a joint-stock company owned by its employees. Today Karlovacka Pivovara is the second leading brewery in Croatia, but the largest Croatian exporter of beer, sending their brew to Austria, Australia, Canada, Germany, Switzerland, Sweeden, USA, Slovenia, Bosnia and Herzegovina. 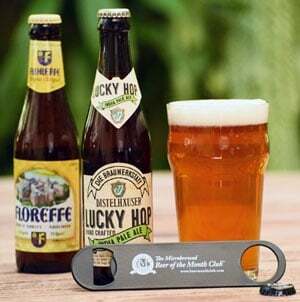 They make no effort to hide their aspirations to regain their former title as the leading brewery in their home country, and have recently poured tremendous capital into the operation to further modernize the facility, expand production and enhance quality assurance. Theirs was the first Croatian beer we’ve sampled—we suspect it will be yours as well. Enjoy! If you’d like more information about the Karlovacka Pivovara, check out http://www.karlovac.com.